NOW A MAJOR motion picture starring Bill Murray, Tim Robbins, Martin Landau, Saoirse Ronan, and Harry Treadaway! 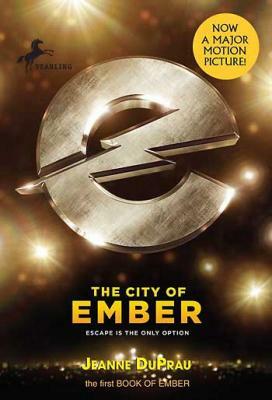 This tie-in edition of The City of Ember features a movie-art cover and an 8-page photo insert. Jeanne DuPrau’s instant classic tells the story of the great, underground city of Ember, designed as a last refuge for the human race. But when the storerooms run out of food and the lights begin to fail, it’s up to two teens, Lina and Doon, to decipher the fragments of an ancient parchment and find a way out of Ember. Jeanne DuPrau has written several books of nonfiction for children and adults. She has been a teacher, an editor, and a technical writer. The City of Ember is her first novel for middle graders. She is currently working on the sequel at her home in Menlo Park, California, where she keeps a big garden and a small dog.